Want an easier way to invest in residential property? Choose which property to buy Bricks in (or use Smart Invest). Our range of properties is carefully selected by our specialist Property Team based on growth potential. You can choose your property in minutes and instantly own Bricks in an investment property. Feeling locked out of the property market? With Bricks from under $50, now there’s an affordable way to invest. Entering the property market right now is unrealistic for me because of the price. BrickX has changed that. BrickX helps me save money in line with the property market and it only takes minutes to invest. 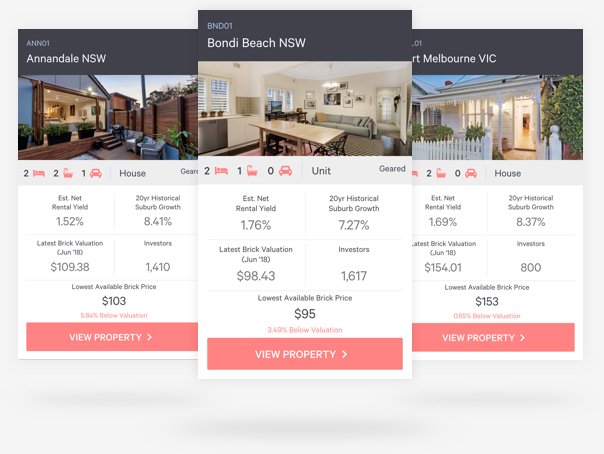 With BrickX I can instantly invest in property at really affordable prices. BrickX offers a range of excellent investment properties to choose from. With all the data BrickX provides, I feel confident in my investment decisions. BrickX allows me to have a diverse portfolio without the need for tens-of-thousands-of-dollars up front for equity. I also don't have the hassle of managing tenants or needing insurance. I use BrickX as a savings and investment account; one in which I see real value and growth. Offer available 1st April (9am AEDT) to 1st May (8pm AEST). T&Cs apply. BrickX has a simple fee structure. For the duration of this promo, you'll only pay 0.5% of the transaction value each time you buy and sell. NAB Ventures, Westpac-backed venture capital firm, Reinventure and BridgeLane have all invested in BrickX business.